This best-selling electric scooter definitely doesn’t lack features, and it’s a fast, convenient ride all-around. It’s fitted with a Lithium-Ion battery, has an incredibly fast charge time, has a chainless, quiet motor and tires that don’t encourage damage or worrying about getting a flat when you’re on the road. The Glion folds easily and can speed up to 15mph on even surfaces. The design even includes a pedestrian bell! The motor of the Glion is a 250 watt, chainless, brushless electric hub motor. It runs solely on its own charge energy and doesn’t pollute the surroundings. All in all, this is a fully eco-friendly scooter that will help make the air just a little bit cleaner, and the roads a little bit safer. Despite the motor being embedded into the scooter, you can also operate the scooter manually should need be. Many customers also report that their Glions run quietly and smoothly thanks to the lack of chains and corks. This motor allows the Glion to speed at least 15mph on even surfaces, and it can handle slight inclines with good dignity and power. This, however, may eat up the battery slightly more than just traveling on straight surfaces. This will ensure that you will reserve all the available motor power for the whole trip, however, it’s good to know that the Glion Dolly can handle slight hills too. The fully aluminum body that supports this motor is also high-quality and supports long, protected rides. It’s a100% aircraft grade, is powder coated for superior protection and is corrosion resistant. This means that driving through damp surroundings won’t damage the Glion. The frame will remain strong and rust-free and will endure all sorts of wear and tear. 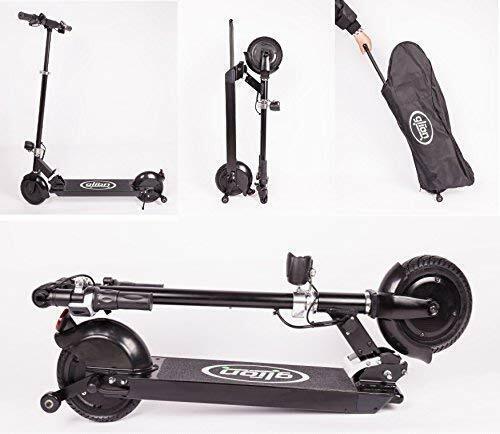 If you are looking for a durable scooter that will accompany you through many errands and fun rides, the Glion Dolly is the ideal choice. Having a fast scooter is just as important as having it fitted with plenty of safety features. All of the features of the Glion are water-resistant, which ensures that should any water splash, you won’t need to be buying a new scooter anytime soon. You can ride it through damp roads, and even when it’s raining. It’s the ideal scooter to have as all-year riding company. If you find yourself needing transport all the time, this scooter will support you anywhere, at any time. The Glion also has an antilock electronic brake, which resides within the rear hub part of the motor, near the rear wheel. This feature greatly supports the braking mechanism to ensure immediate, fast and painless stops. All you need to stop is twist the left-hand handlebar to brake! All of the mechanism is highly sensitive and responsive, to ensure maximum safety. Weight and size are always a huge factor in determining who a toy best suits. Luckily, the Razor PowerWing electric scooter product for kids comes in at just 12 pounds, which is light enough for almost any rider. It’s very close to the same weight as a normal kick scooter. The Glion is definitely meant for fast commutes. With its 15mph maximum speed, it’s easy to see why so many eager commuters flock to purchase the Dolly. You will be able to keep up to speed with most of the bicycle folk riding by your side. Adding the fact that you won’t be stuck in traffic jams, most of the time the Glion can also be considered faster than cars and motorcycles themselves. All you need to do to go faster is turn the throttle and speed by. The scooter gets to maximum speed quickly, but in gradients, to ensure that you won’t get thrown off the deck. Thanks to the gradient speed, you can also keep the speed as slow or as quick as you need. If you are walking with a friend, you can adjust the scooter to ride slowly to adjust their pace. The battery of the Glion is powerful & durable. It’s one of the few batteries that can charge in such a quick time as the Dolly does. 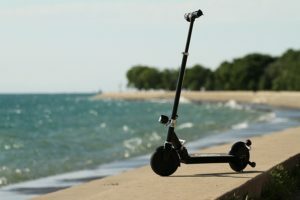 The scooter can be fully charged within 3.5 hours, and 75% charged within 2 hrs. No matter how late you get home, you will still be able to quickly plug in your scooter and wait for it to fully regain its life. For a trip to and from work, most customers find this scooter ideal for their needs. Most even still have battery left over after their commutes. In general, the scooter handles about 21 miles worth of riding per charge. This is a very good ratio and is perfect for errands and quick rides to the shops or to and from work. It’s also important to mention the general lifespan of the battery before you will need to go out and buy a new one. The battery within the Glion lasts around 1000+ cycles. For any ordinary rider that will be commuting every day, this is a fantastic reliable number that ensures a relatively small upkeep cost. The only thing you should pay attention to is not over-charging the battery. 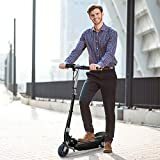 This can significantly damage its effectiveness, and in the long run, decrease the power and speed of the scooter itself. The Glion wouldn’t be itself without its original, additional features. These features include a headlight, that will help you see during dim light and nighttime, and a rear reflector that will help you be seen in return. One thing that we were glad to see here is the addition of the pedestrian bell. Many customers wrote tongue-in-cheek complaints about the scooter being way too quiet, resulting in passersby not hearing their approach. The bell was included to solve this problem, and it’s definitely a fantastic addition. It helps encourage pedestrian safety and resolves the age-old question as to why bicycles have pedestrian bells and scooters do not. The scooter can also be folded within seconds and transported like a suitcase thanks to the unique folding design that includes a trolley handlebar. If you need a travel scooter, the Glion Dolly will be happy to accompany you to any country, any city, any town as long as there are pedestrian roads. All without cluttering your inventory. The small luggage wheels eliminate the need to drag the scooter in your hand, thus giving you full freedom. The Glion weighs about 27lbs, which is extremely light for a scooter of its caliber. The general size of the Glion Dolly equals to about 37.4 x 7.9 x 11.8 inches, which are the perfect travel dimensions for anyone that doesn’t want big luggage to drag around. The Glion Dolly is perfect for adults and teens who need to commute quickly and safely from point A to point B. It’s also ideal for travelers thanks to its stunning portability. Whether you need to get to work, to college, or run a quick errand at the nearby shop, the Glion will have you covered in all aspects. 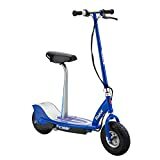 All in all, if you are above 12 years of age and are mature when it comes to riding a scooter and are well-versed in riding and pedestrian safety, the Glion will be ideal for you! It’s ideal for most budgets, and should definitely cost way more for all the features that it offers. The Glion is the most ideal commuter scooter available on the market today. Simply thanks to its amazingly quick charging times, its fantastic fuss-free portability, and its speed. If you need to get somewhere, you can rest assured that the Glion Dolly will get you there. The wheels can ride over small bumps and inclines and are designed to never to be flat thanks to the honeycomb pattern. This scooter is a great ride, no matter where or when you need a quick lift, you know you can rely on the Glion Dolly to support you through your journey.